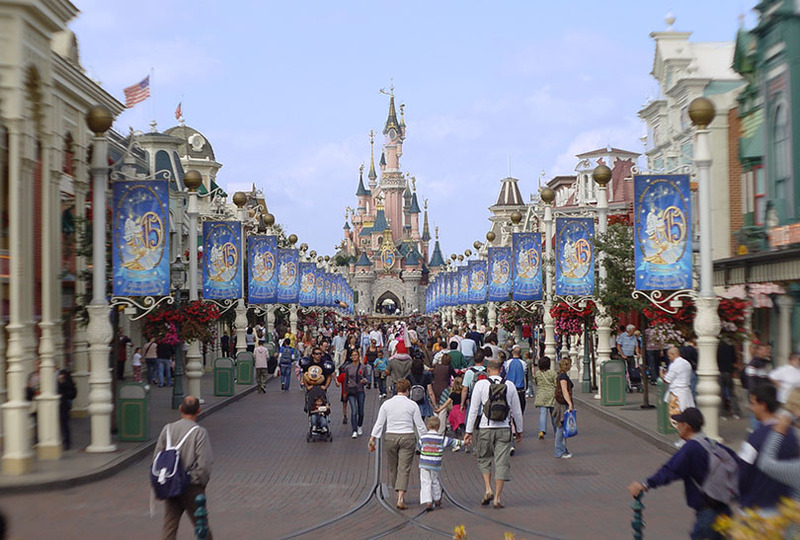 Disneyland Paris (DLP) opened in 1992 with two parks. 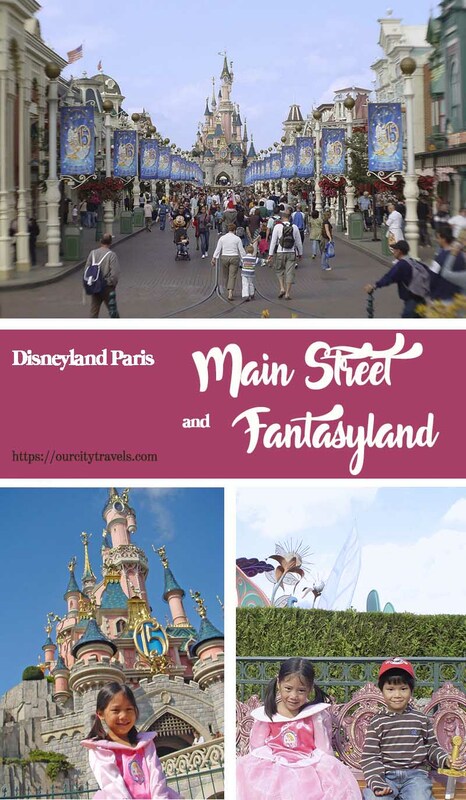 Disneyland Paris Park, the first of the two theme parks is divided into Main Street, USA and 4 other themed ‘lands’ named Fantasyland, Frontierland, Tomorrowland, and Adventureland . The other being Walt Disney Studio. Disneyland Hotel (above photo), is an in-house hotel and is also the entrance to the Park. They also sell tickets there. 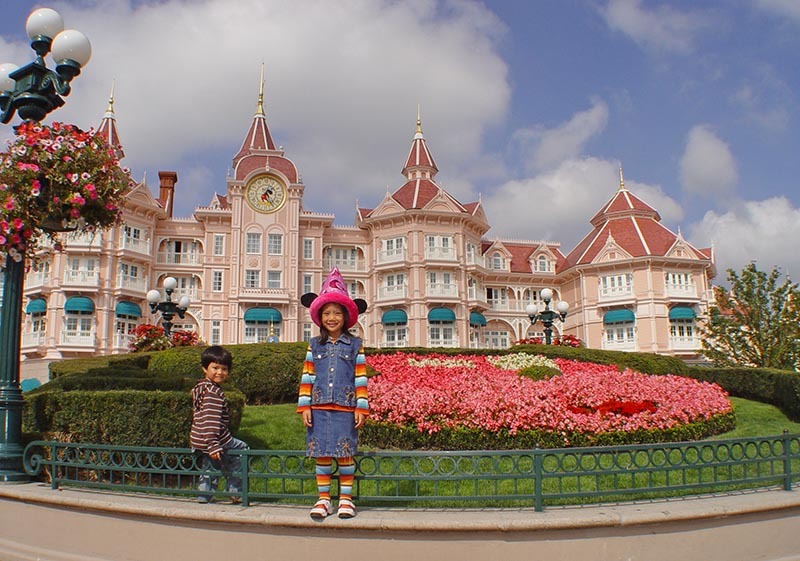 If you are solely spending time at Disneyland Paris – Park, Disney Studios, and Disney Village, we recommend booking this hotel. 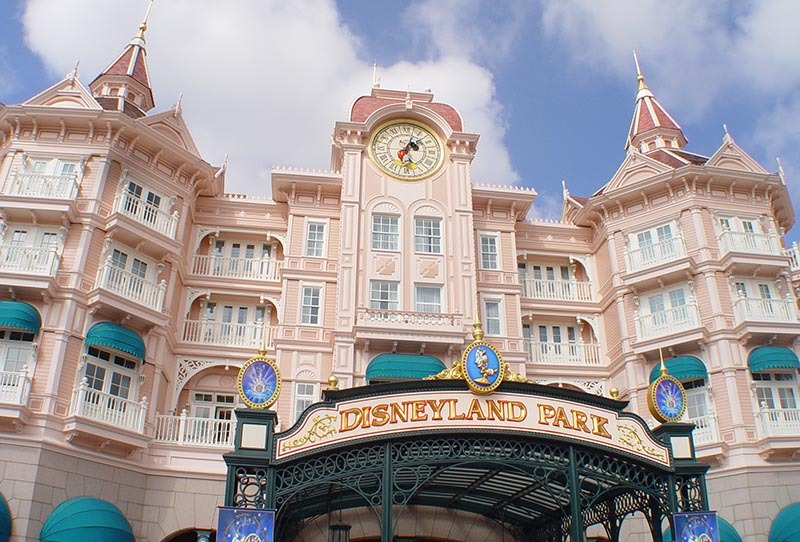 There are a number of things to consider when booking a hotel for your Disneyland stay, and proximity tops that list. 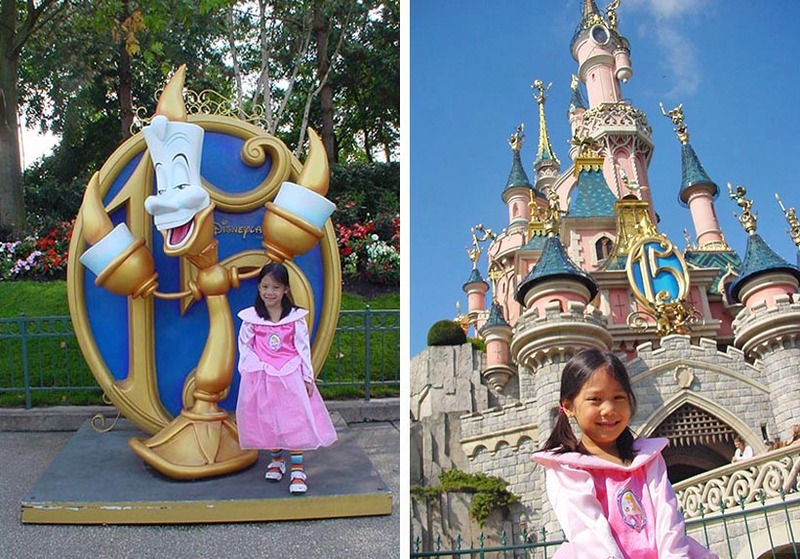 It is best to look for Disneyland Paris Packages, that would include park tickets, hotel stay, and transportation to DLP for convenience. ^ C and A posing by the Mickey flower ensemble in front of the hotel entrance. So how do you wisely spend your day/s at Disneyland? I suggest go about each section one at a time. Going back and forth will make you lose precious minutes and tire you (the kids as well). So let’s try to map out what things to do and try at the Park. 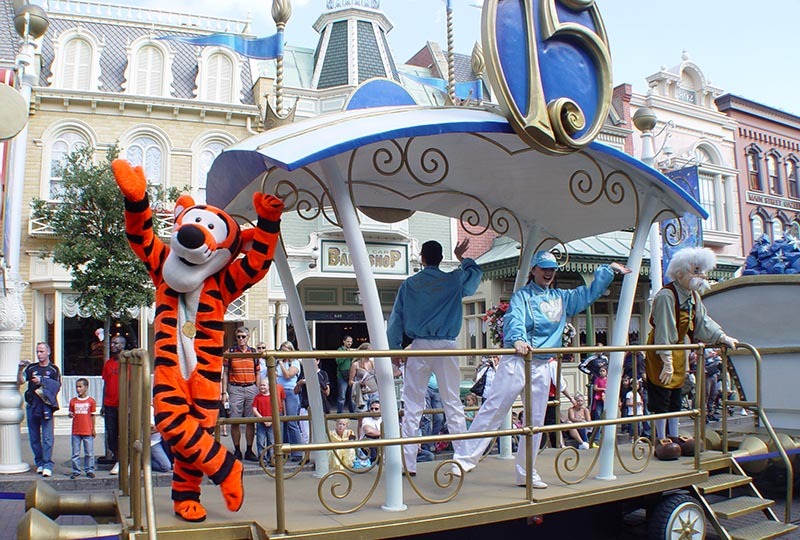 During the parade, Tigger (Disney’s Winnie the Pooh) and Geppetto (Pinocchio) were together on board a wagon. Notice the rail tracks, as the street has a tram for the visitors too. Above is one of the featured automobile also on parade. There are cars that also tour around with the guests and sometimes with the mascots. 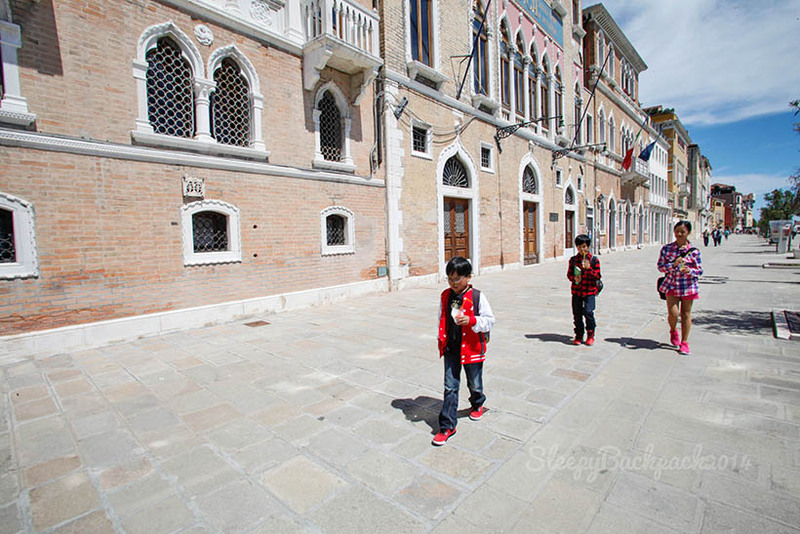 Left: front/entrance of one souvenir shop. Notice: Kodak, yes they sell mostly Kodak products. The attendants are really friendly but they would almost always speak to you in French when you enter. Most of them speak English though. But it was also nice when a cashier who seems not fluent in English heard me speaking with C later on conversed with me in German. I felt confident I won’t get lost. lol. Inside one of the shops we entered was a surplus of Mickey mouse and other Disney toys, souvenir items, clothing, memorabilia and more. The prices are generic at all of the shops. Security is a little lax though, don’t be surprised if you see people shoplifting…’coz I did. I tip my hat off to those who remain honest. 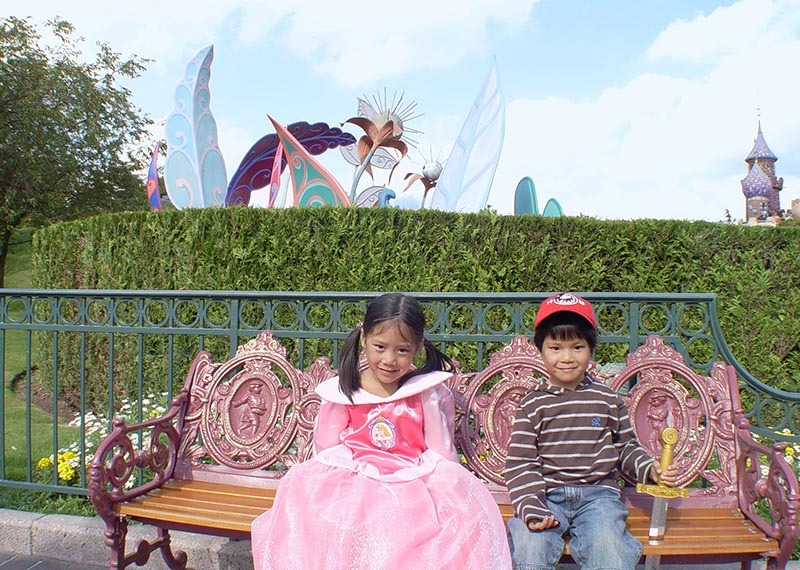 My boys sitting at the Pavilion which is parallel to Sleeping Beauty’s Castle, and our daughter in her pink Aurora dress. One of the stuff we bought that proved to be useful later on is a pink gown for our little princess. 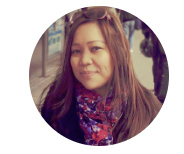 See, she’s standing here with Sleeping Beauty’s castle at the background. The dress was perfect, should we have bought Cinderella’s dress then the castle should be blue…fortunately, she likes pink and pink is Aurora’s gown. However, meticulous as she is, she had one complain. 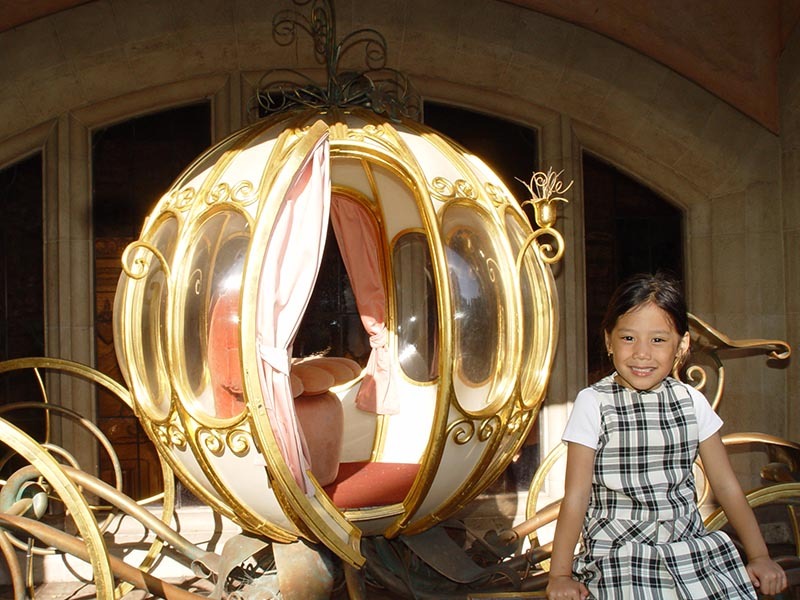 “Mali momie, kasi black ang hair ko dapat dress na lang ni Snow White, I can’t be Aurora, hindi naman kasi ako blonde.” (This is wrong momie, I have black hair so it should have been Snow White’s dress, I can’t be Aurora, I’m not blonde after all.) Oo nga naman(True that!). One of the uses I was talking about is this: sending entries to the Disney Princess magazine. C finished his mickey ice cream. 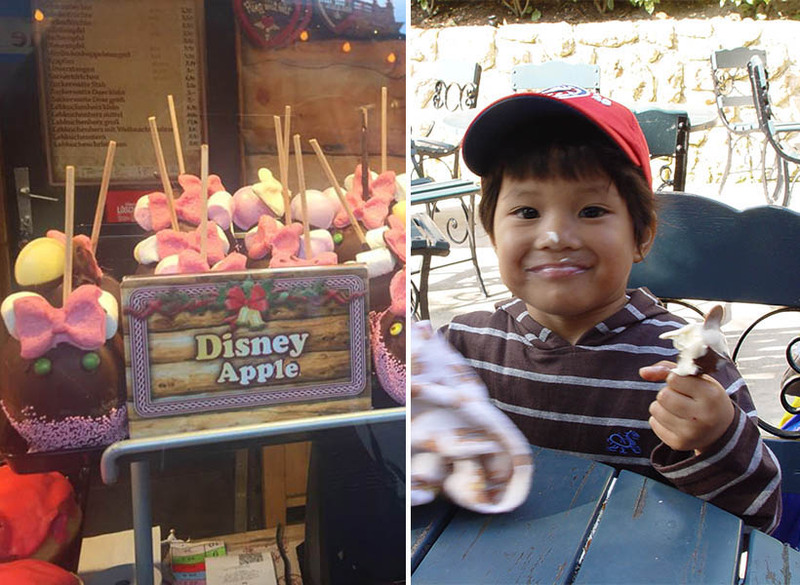 Themed snacks can be found all over the park, as you would in any other Disneyland parks. There’d be waffles, lollipops, popsicles, donuts shaped as mickey mouse from snack stands. There’d be Pomme de Amour or candy apples in different colors and flavors – one inspired by Snow White’s poisoned apple stands out. There are offerings of sandwiches, burgers and fries, pizza, in the quick service restaurants sprinkled around the park. The Market House Deli (right side when facing the castle) is a good stopover for a quick sub of your favourite fillings. There are also coffee shops to while and wait in or rest a bit after too much walking. For a more serious meal, Walt’s – an American restaurant is very near the Town Square, you can fuel up then and there with offerings of seafood (starters to mains),tenderloins, pork chops, among other sumptuous dishes. This is mostly the magic-filled area of the Resort. It’s a fairy tale village, like where the Disney characters would have lived in real life. The entrance to the village is Sleeping Beauty’s castle set on a moat, you have to go in via a bridge. Inside, you can find rides that were inspired by different movies. 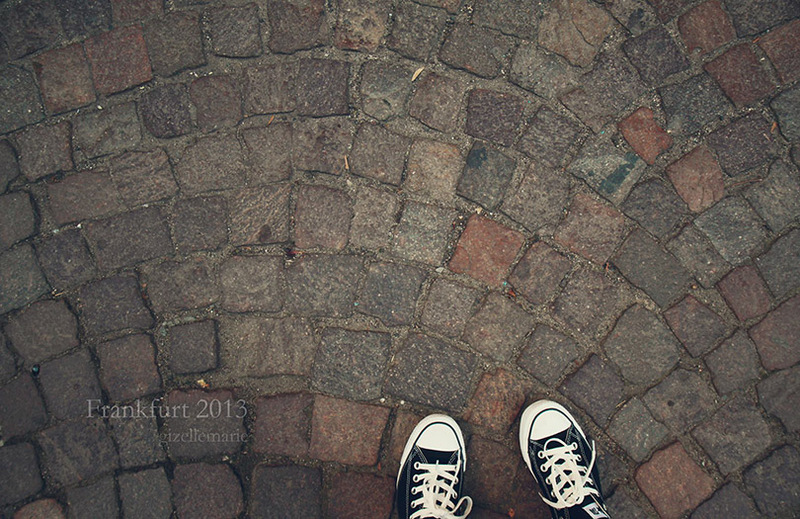 There are also many spots to take pictures at. Literally, everything that you’ve seen in Disney movies. 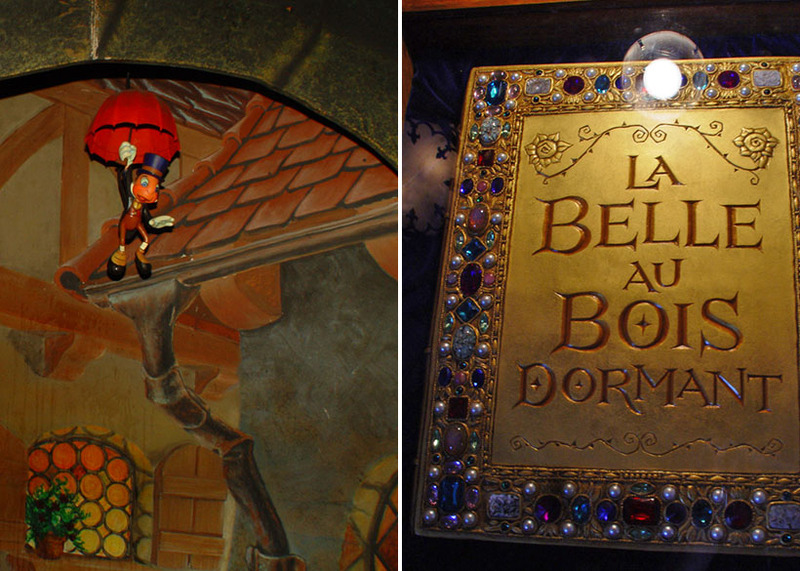 At the entrance of Sleeping Beauty’s Castle was a small door with a vitrine full of crystals. Most of them are Disney character’s mini-sculptures but there are huge masterpieces as you see here partly, a replica of the castle. We decided that this precious piece would be our souvenir from the Park. The attendants took our photos starting from Daniel. The woman in the photo appears to be the Supervisor here, she came and spoke to us (english) but when she heard me call out: “Da-niel!” She instantly knew that we speak German ( just by the pronunciation..as in English would be pronounced Day-nyel, Filipinos would say Dan-yel, and in German we say Da-nyel). The rule is to not move for 5 seconds while the photo is being taken and to look on top of the camera…the box was ready after 2 hours and we paid an addition since there were 5 of us…the most that they have made were for 4 people. Town behind the Castle, Le Carrousel de Lancelot can also be seen from here. Looking from the window of the castle, one would see a small town of sorts pictured above. 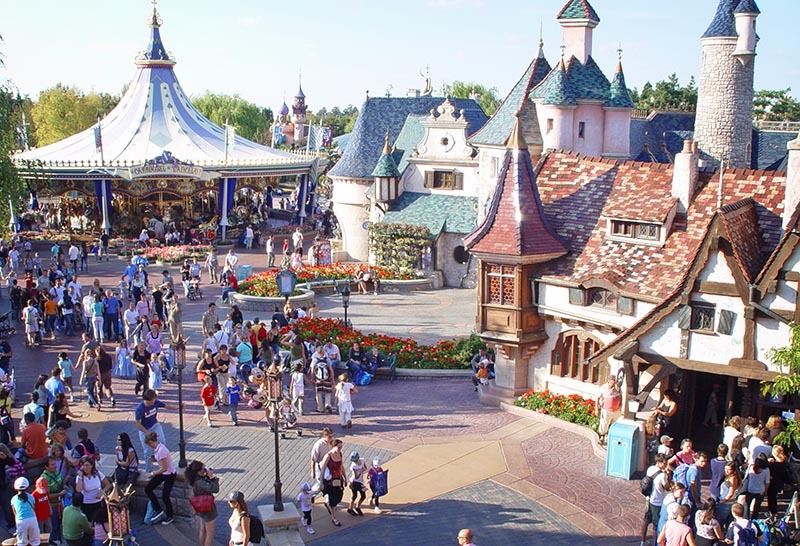 In the middle is Le Carrousel de Lancelot, pony rides with an organ music playing in the background – of Disney songs we love to sing along with. The Sword in the Stone is a feature near the carousel. It is a nod to the Disney movie of the same name. 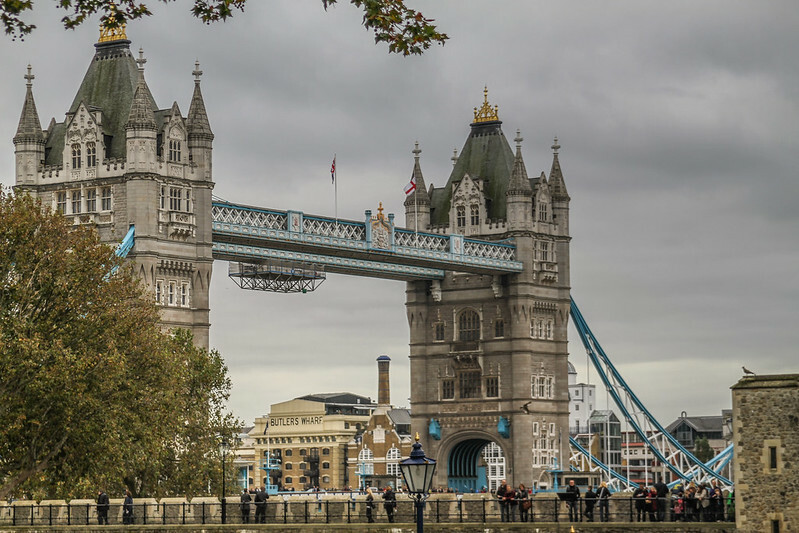 Kids and adults can try to pull the sword out and be king for the day – just as King Arthur did as a young child. 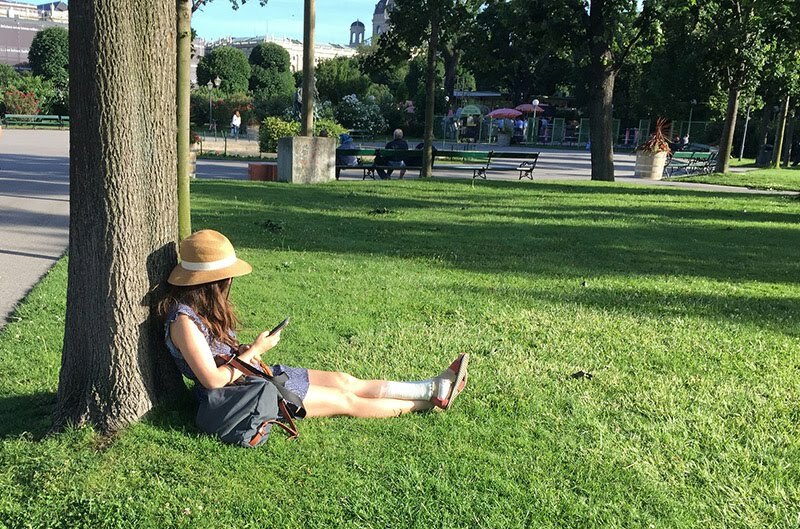 Update: July 2015 – Someone was able to fully pull the sword out! There are stores in this village along with other rides. 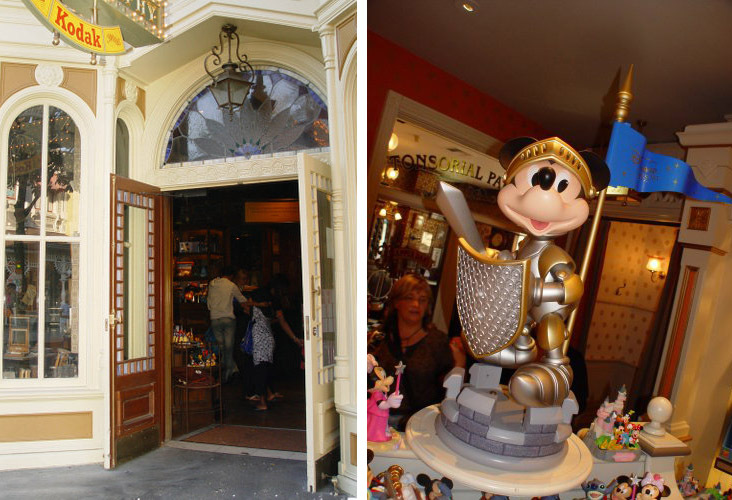 Some shops to see and buy some souvenirs and sweets from are La Bottega di Geppetto (Gepetto’s Shop), Sir Mickey’s Boutique, and La Confiserie des Trois Fées (The Three Fairies’ Sweet Shop). Some rides I don’t have pictures of (just outside or line ups) are Casey Jr. – Le Petit Train du Cirque (Casey Jr. Circus Train), Blanche-Neige et les Sept Nains (Snow White’s Scary Adventures) and It’s a Small World. Jiminy insie Les Voyages de Pinocchio, and Book – ‘Sleeping Beauty’ by the castle’s stairs. Photo above left is of Jiminy Cricket from Les Voyages de Pinocchio, a 2-minute ride which will show you the journeys of Pinocchio, presented by puppets…the rides were made of wood inspired by Geppetto’s works. Sitting by the bushes…behind is Alice in Wonderland’s Curious Labyrinth. This maze is in the British part of the Fantasyland, as the book ‘Alice in Wonderland’ was written by an English writer, Lewis Carroll. The goal is not to get out of the maze, rather to find the Queen of Heart’s castle. Atop the castle, one is rewarded with a wonderful view of the Fantasyland. If you manage to get out, head over to March Hare Refreshments for some tea party! They also serve coffee, non-alcoholic drinks, crepes, and ice cream among others. 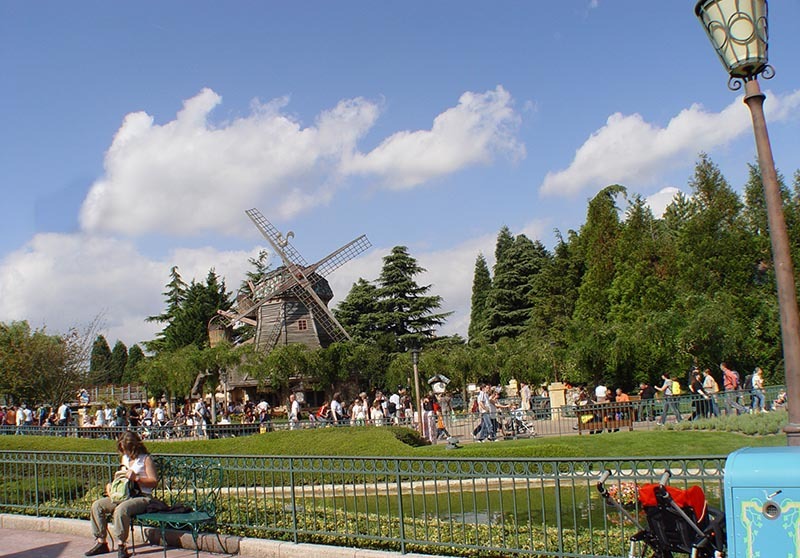 There’s a snack stand in the shape of a wind mill just outside Alice’s Curious Labyrinth. Some refreshments can be had in case the kids get tired. For a heavier meal, try Toad Hall Restaurant’s affordable menus – fish and chips will load you up with carbs and proteins to continue your journey around the park. Waving while still on board Dumbo the Flying Elephant. 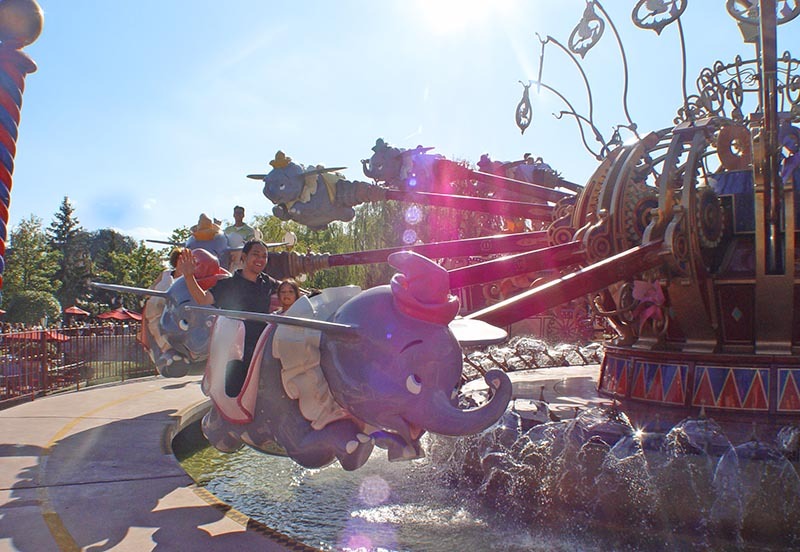 As Dumbo flies, so does this ride. It’s an aerial carousel with Dumbo dressed in different colours as ride vehicles. There’s a joystick that you can maneuver for the vehicle to go up and down. 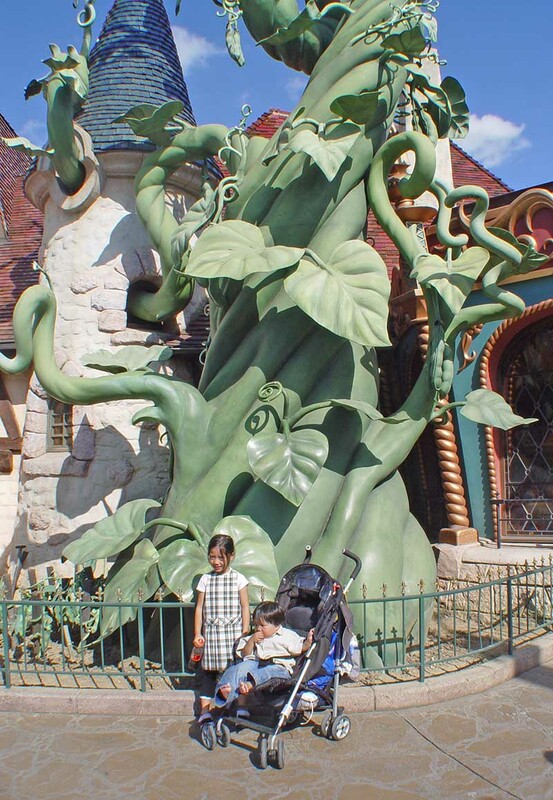 When we say Beanstalk within Disneyland Paris Park, it automatically means that giant one where Jack went up. It is situated outside a store, it’s sole purpose is for photo opps. It can’t be climbed on to but it’s a really beautiful representation of Jack’s Beanstalk. The kids can visually imagine how big it might have been for the giant to be able to go down from there. 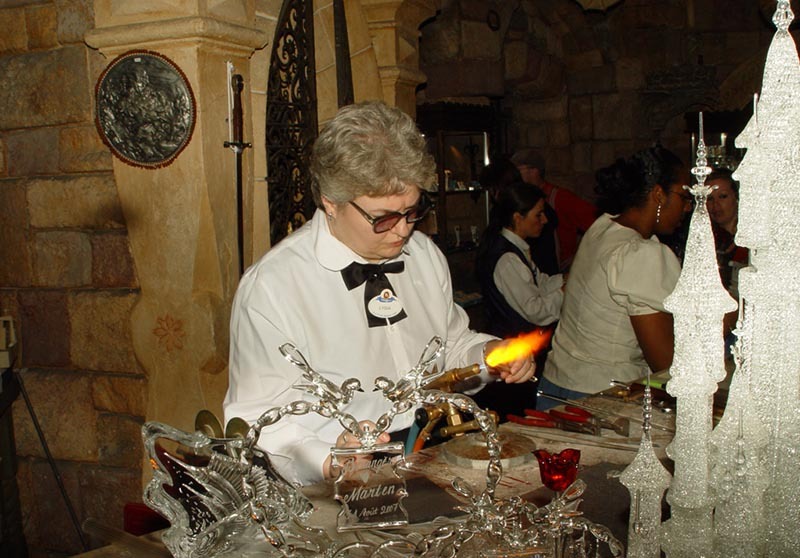 If you have set aside a big chunk of your budget for food, have a wondrous French meal at Cinderella’s Inn. They serve a full course meal you can choose from: Amuse-bouche of cheese gougères, wild prawns with saffron butter, and Cinderella’s dessert. The courtyard has table and chairs for diners, but inside seating is also provided. Don’t forget to take a picture by the Pumpkin chariot before you leave. Note: Reservations on most restaurants are required. 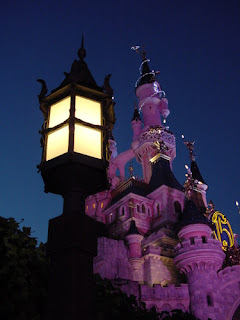 There were still so many stuff that we were not able to see, but we had enough memories to make us remember the fantastic and enchanting experience at Disneyland Paris Fantasyland.